Ever get that feeling that it’s time for a change? Around this time of year, we’re all busy trying to reinvigorate ourselves by forming powerful new habits. While you’re in the mood, perhaps it’s also time to take a duster to your online presence, and namely your Snapchat username. Except, you can’t. That’s right folks: Snapchat doesn’t let you change your username for “security reasons.” We’re not sure that argument holds water. Even Facebook lets you change your name and vanity URL. Snapchat offers two solutions. Let’s take a closer look. Oddly, the first method Snapchat suggests is to simply delete your Snapchat account and create a fresh one. Given that Snapchat is struggling for users, recommending people to delete their account seems rash, to say the least. 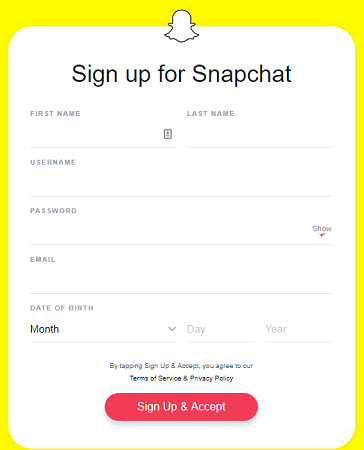 To make a new account, navigate to accounts.snapchat.com, click on Create Account, and fill in the form. Make sure you enter your new preferred username. When you’re ready, click Sign Up and Accept. Tap the Gear icon in the top right-hand corner of the app. Enter your new preferred display name. Your new name will be instantly visible across the Snapchat network, and it will show up in search results when other people look for it.